When Steve Barham started his business 6 years ago, after retiring from Reynold’s Metals, it was just him, selling seafood out of his Ford Expedition, wherever he was lucky and smart enough to set up. 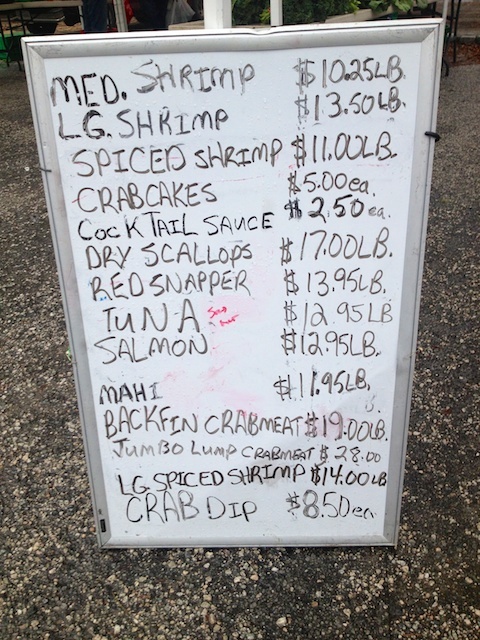 Folks started to recognize Steve and seek out his fresh seafood, and now, after 3 years at the South of the James Farmers Market, Steve has two refrigerated trucks and a staff of about four family and friends. In that time, Steve’s been at several markets in Richmond, and this year he’s toying with the idea of going as far as Charlottesville. His success is due to a strong work ethic and positive attitude. Despite growing costs in the seafood market, Steve tries to keep his prices reasonable, which means working even harder. On most days, you can make a safe bet that Steve’s out of bed before you are. 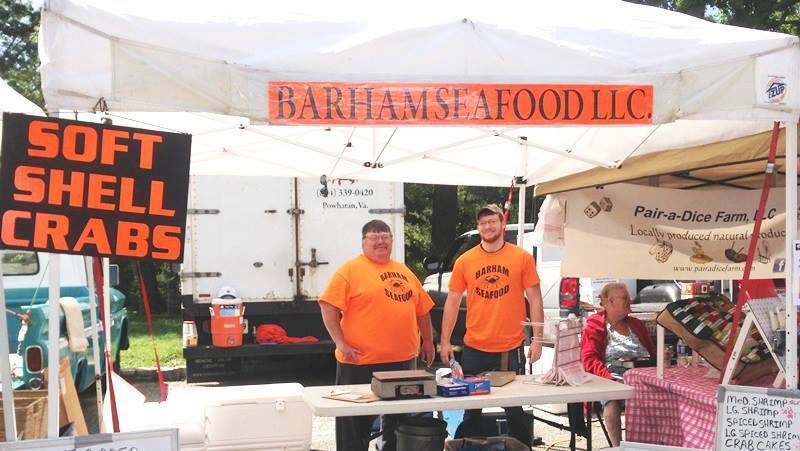 Even more than the reasonably-priced selection, the best reason to get to know Barham’s Seafood is to get to know the Barhams. They’re the friendliest people, always ready to chat about football, hunting, and of course, seafood. So friendly are they, in fact, that Steve is offering a $20 gift certificate for this week’s giveaway. Like, share, or comment on this post on Facebook, and you’ll be entered to win the $20 gift certificate! The winner will be announced via the GrowRVA facebook page at 8 pm on Friday night and will be available for pick-up at the market the next day. I love to fish the bay, and I was getting ready to retire from Reynolds Metals. I get up at 1:00 a.m. Wednesday through Saturday. Working other locations and spending time with my family. Walnut Hill Farm and Real Country Sausage. Oysters because people love them at Christmas time.